There are two form of acute lymphoblastic leukemia which are B cell acute lymphoblastic leukemia and T cell acute lymphoblastic leukemia. Acute lymphoblastic leukemia is divided based on the lymphoblastic surface antigen that present. B cell acute lymphoblastic leukemia is based on the present of the B cell antigens which include CD 10 and CD 19. T cell acute lymphoblastic leukemia is based on the present of the T cell antigens such such as CD 2, CD5 and CD7. ,lymphadenopathy, infection, pain in the bone and tired/fatigue. However, acute lymphoblastic leukemia carries a good prognosis with high responsive rate to treatment. The investigation may include bone marrow analysis, peripheral blood smear and TDT marker. Bone marrow analysis may reveal distortion of the architecture of the bone marrow with hypercellularity which consists mainly of lymphoblast. TDT or terminal dexoynucleotidal transferase is tumor marker for detection of the immature B cell lymphocytes and T cell lymphocytes. Peripheral blood film/peripheral blood smear may reveal excessive lymphoblast ( lymphocytosis ) and pancytopenia. The treatment option of acute lymphoblastic leukemia may include series of chemotherapeutic approach and transplant of the bone marrow. 1.Pui, Ching-Hon, Mary V. Relling, and James R. Downing. “Acute Lymphoblastic Leukemia.” New England Journal of Medicine 350, no. 15 (2004): 1535–1548. doi:10.1056/NEJMra023001. 2.Chan, Ka Wah. 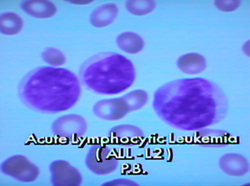 “Acute Lymphoblastic Leukemia.” Current Problems in Pediatric and Adolescent Health Care 32, no. 2 (February 2002): 40–49. doi:10.1067/mps.2002.121790.